As noted in the following table, domestic equities were again led by technology and growth stocks, though most equity and fixed income asset classes showed gains in the quarter. Despite ongoing cuts to economic projections in Europe, Japan and many Emerging Market economies, non-US equities also reported strong gains, with EAFE reporting a +10.0% gain and Emerging Market Equity Index showing +9.9% gains. The dovish “pivot” from the Federal Reserve on 2019’s monetary policy. Evidence that a US/China trade agreement is imminent. The impact of the changed view on monetary policy cannot be overstated, as markets performed strongly in the face of cuts in estimates of both global economic growth and earnings for U.S. companies in aggregate. For Q1 2019, the estimated earnings decline for the S&P 500 Index is -4.2%. If -4.2% is the actual decline for the quarter, it will mark the first year-over-year decline in earnings for the index since Q2 2016.5 While actual earnings are likely to surpass that expectation based on historical tendencies, equities have rallied substantially with little earnings gains expected in the near-term, a testament to the influence of monetary policy on investor psychology. Earnings are likely to be flattish despite expectations of revenue growth in the +5% range, which is further evidence that profit margins are being impacted by rising wages, energy and interest costs. Investor psychology has also been helped by recent improvement in Chinese economic data following several steps by their government to stimulate growth through both monetary and fiscal measures. Investors have also cheered continued signs of moderate inflationary pressures as recessionary conditions present in much of Europe have cooled worries about wage pressures and inflation in the U.S. Still, forward P/E ratios for the S&P 500 Index have risen to 16.7x at quarter-end from 14.1x at year-end and two of the necessarily catalysts (Fed pivot and trade deal) have happened or are expected to. This leaves further improvements in equites up to the “heavy lifting” of better-than-expected economic and earnings growth. A briefly inverted yield curve in the U.S. is a market-based signal that this “heavy lifting” may be difficult in addition to some high-profile earnings warnings (3M, Apple, Walgreen Boots) that reminded investors that the tax-induced bump in earnings in 2018 is over. 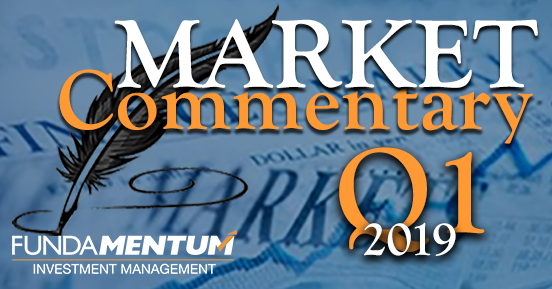 Risks to the outlook for equities include recessionary conditions in much of Europe, growing wage pressures in the U.S., peaking profit margins, an ever-growing U.S. Budget Deficit, Brexit and, not to be forgotten, the consummation of an actual trade agreement with China. Risks have likely been ignored due to the important change in U.S. monetary policy and given the depressed valuation and sentiment coming into the year, risk assets were able to rally to reflect that change. Still, while economic and earnings expectations are falling, certain market indicators paint at more optimistic view of conditions. These include the strong performance in cyclical sectors like Technology, Energy, Industrials, and Consumer Cyclicals, which have outpaced the S&P 500 Index.3 Pockets of the industrial metals and commodities have also outperformed, perhaps a sign of optimism over economic conditions in China. Fundamentum Tactical portfolios were overweight equities coming into the year, with a focus on U.S. equities over non-U.S. equities. During the quarter, we moved to a neutral position equities/bonds in those tactical weightings believing that equities now fairly reflect the risk and return outcomes we see as most likely for the foreseeable future. We maintain our US equity bias. We also moved to a modest growth overweight in equities toward the end of the quarter as growth stocks tend to outperform in periods of slower economic growth and lower interest rates. On balance, we believe a neutral position reflects our view that markets can continue to grind higher while also providing potential cushion should the risks highlighted suddenly emerge. As always, we appreciate your confidence in our team and are available for questions. Investment advice offered through Fundamentum LLC a registered investment advisor. The opinions voiced in this material are for general information only and are not intended to provide specific advice or recommendations for any individual. There is no assurance that the investment objective of any investment strategy will be attained. Investing involves risk including loss of principal. Past performance is no guarantee of future performance. All indices are unmanaged and may not be invested into directly. Stratos Wealth Partners provides advisors and their clients with a distinctly different wealth management experience. One that effectively elevates all aspects of the financial and investment management experience for clients seeking more personalized concierge level service and innovative thought leadership. Stratos provides access to a wide range of financial products and strategies available in the marketplace today without the restrictions and conflicts of interests commonly found in most large brokerage firms and investment banks. Stratos provides the infrastructure, resources and support necessary to allow financial advisors to focus on their core competency—advising their clients. And that, in turn, allows their clients to focus more time and energy on their own passions in life. Today, Stratos has a national network of distinguished, experienced financial advisors and financial planning practitioners spread throughout the country, all powered by LPL Financial, member FINRA/SIPC. The opinions voiced in this material are for general information only and are not intended to provide specific advice or recommendations for any individual. To determine which investment(s) may be appropriate for you, consult your financial advisor prior to investing. All performance referenced is historical and is no guarantee of future results. All indices are unmanaged and may not be invested into directly. Investing involves risk including loss of principal. Investment advice offered through Fundamentum, LLC., a registered investment advisor.